Stimulating neural dust; 3D skin-printed electronics; AI on sw development. 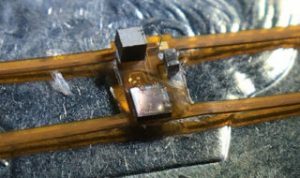 UC Berkeley researchers, co-led by Rikky Muller, who is also assistant professor of electrical engineering and computer sciences at Berkeley, have built what they say is the smallest volume, most efficient wireless nerve stimulator to date. Before this milestone, UC Berkeley engineers demonstrated the first implanted, ultrasonic neural dust sensors in 2016, bringing closer the day when a Fitbit-like device could monitor internal nerves, muscles or organs in real time. 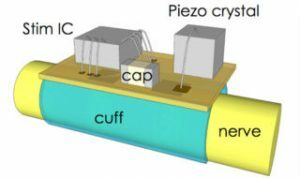 The new device, called StimDust (stimulating neural dust), adds more sophisticated electronics to neural dust without sacrificing the technology’s tiny size or safety, greatly expanding the range of neural dust applications. The researchers said their goal is to have StimDust implanted in the body through minimally invasive procedures to monitor and treat disease in a real-time, patient-specific approach. StimDust is just 6.5 cubic millimeters in volume, about the size of a granule of sand, and is powered wirelessly by ultrasound, which the device then uses to power nerve stimulation at an efficiency of 82 percent. The research team was co-led by one of neural dust’s inventors, Michel Maharbiz, a professor of electrical engineering and computer sciences at Berkeley. “One of the big visions of my group is to create these very efficient bidirectional interfaces with the nervous system and couple that with intelligence to really understand the signals of disease and then to be able to treat disease in an intelligent, methodical way. There’s an incredible opportunity for healthcare applications that can really be transformative,” she added. In a development that could allow, for example, soldiers on the battlefield to print temporary sensors on their bodies to detect chemical or biological agents or solar cells to charge essential electronics, University of Minnesota researchers used a customized, low-cost 3D printer to print electronics on a real hand for the first time. One of the key innovations of the new 3D-printing technique on skin is that the printer uses computer vision to track and adjust to movements in real-time. The team also reported it has successfully printed biological cells on the skin wound of a mouse. The technique could lead to new medical treatments for wound healing and direct printing of grafts for skin disorders. The team explained that one of the key innovations of the 3D-printing technique is that this printer can adjust to small movements of the body during printing. Temporary markers are placed on the skin and the skin is scanned. The printer uses computer vision to adjust to movements in real-time, and no matter how hard anyone would try to stay still when using the printer on the skin, a person moves slightly and every hand is different. 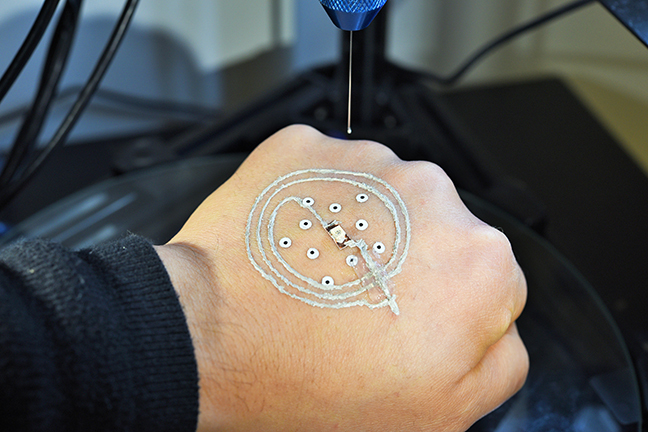 This printer can track the hand using the markers and adjust in real-time to the movements and contours of the hand, so printing of the electronics keeps its circuit shape. Interestingly, this 3D-printing technique uses a specialized ink made of silver flakes that can cure and conduct at room temperature, which is different from other 3D-printing inks that need to cure at high temperatures (up to 100 degrees Celsius or 212 degrees Fahrenheit) and would burn the hand. To remove the electronics, the person can simply peel off the electronic device with tweezers or wash it off with water. The researchers expect this technique to pave the way for many other applications, including printing cells to help those with skin diseases. They partnered with University of Minnesota Department of Pediatrics to successfully use a bioink to print cells on a mouse skin wound, which could lead to advanced medical treatments for those with skin diseases. 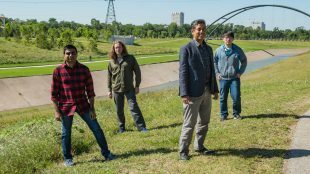 Rice University researchers have created a deep-learning, software-coding application that can help human programmers navigate the growing multitude of often-undocumented application programming interfaces, or APIs. Known as Bayou, the Rice application was created through an initiative funded by the Defense Advanced Research Projects Agency aimed at extracting knowledge from online source code repositories like GitHub. Users can try it out at askbayou.com. Rice University computer scientists (from left) Vijay Murali, Chris Jermaine, Swarat Chaudhuri and Letao Qi created a software-coding application called Bayou that can help human programmers by writing chunks of code in response to keywords. The team noted that Bayou is based on a method called neural sketch learning, which trains an artificial neural network to recognize high-level patterns in hundreds of thousands of Java programs. Read more about Bayou here.